Find the answers to questions that pique your curiosity in our series, “The Short Answer.” Vascular surgeon George Anton, MD, explains the best way to get rid of spider veins. Q: What is the best way to get rid of spider veins? A: Spider veins can be removed by laser treatment or sclerotherapy. Both of these treatments provide satisfactory results with almost no downtime. Patients most often can resume even high-intensity physical activity the next day. Laser treatment is popular. It destroys the vein by penetrating the skin. However, it burns as it penetrates and unfortunately tends to damage the skin. Also, it only destroys one little part of a vein at a time. I personally don’t employ laser treatment for spider veins. Sclerotherapy treats large areas of veins by injecting a solution through a tiny needle. The solution, which irritates the vein and causes it to scar and shut, disperses to all the branches of the vein. You can watch them disappear immediately. It’s a much more efficient procedure and is much less likely to cause skin damage. The needle is so small and delicate that it’s almost painless. The solution also is painless. Regardless of procedure, patients will wear a compression wrap for several hours after the procedure — or overnight, for larger veins. You want the vein wall to scar down and stick so no blood gets into it and the vein is no longer visible. 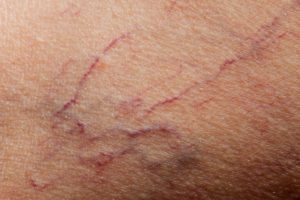 Once you’ve treated the spider veins, they don’t come back, although you might get new ones. There’s no way to get rid of 100 percent of visible veins. (You might see advertisements that show no veins at all. That’s unrealistic.) But to get rid of 80 to 90 percent of your visible veins is a reasonable expectation. Even with sclerotherapy, it’s never a one-and-done process. It may take two or three visits to achieve the final result, followed by maintenance visits as new veins appear.